For other uses, see The Harder They Come (disambiguation). The Harder They Come is a 1972 Jamaican crime film directed by Perry Henzell and co-written by Trevor D. Rhone, and starring Jimmy Cliff. The film is most famous for its reggae soundtrack that is said to have "brought reggae to the world". Ivanhoe "Ivan" Martin is a poor Jamaican man in search of a job. He leaves his rural home after his grandmother dies to live with his impoverished mother in Kingston. He meets Jose, who takes him to see Django, a Spaghetti Western. Excited by urban life, he tries to get work but fails. He finally gets a job with a preacher, he also takes a broken bicycle frame and rebuit it into a working bicycle, and uses it to run errands for a record producer. He gets into trouble with the preacher after he used his church for secular songs. After being fired by preacher he returned to the house to collect his bicycle, that preacher had now officially given to Ivan's colleague, the two fight after he refuses to give Ivan the cycle; Ivan slashes him with a knife, a crime for which he is sentenced to a whipping. Ivan interests the record producer in a song he writes and performs, "The Harder They Come", but he only gets $20 for it. He dreams of stardom, but the stranglehold the producer has on the music industry condemns Ivan to work for a pittance. Eventually Jose offers him an opportunity dealing marijuana, moving the drug from the country to the city on a motorbike. When Ivan complains about the pay and conditions, Jose informs on him to the police. On his next trip, when a policeman tries to flag Ivan to stop, he panics and shoots the officer. Next, Ivan meets a woman in a hotel. While he is in bed with her, the police surround the room and try to capture him. He shoots his way out, killing three officers. On the run, he returns to shoot and wound the girl he slept with, believing she and Jose betrayed him. He then finds Jose and pursues him, shooting at him, but Jose escapes. Ivan returns to the countryside, but the police catch up with him, leading to another shootout and escape. Ivan seeks support from his drug-dealer friends, who help him hide out. The policeman leading the search cracks down on the drug trade, telling the dealers he will not relax the pressure until they give Ivan up. Meanwhile, the record producer re-releases Ivan's song, which rapidly becomes a hit because of Ivan's notoriety. Enamoured of his new fame, Ivan has photographs of himself made holding two guns in gangster poses, and he sends them to the press. He also steals a flashy car and drives it around a golf course. One dealer friend advises Ivan to escape to Cuba. Seeing the ship he hoped to escape on leaving, Ivan swims out towards the speeding vessel. However, he cannot grab onto the ladder dangling off the side, and he opens his eyes to find himself beached ashore. Ivan sleeps in the shade of a tree then awakens, alerted to the presence of policemen with rifles. He exchanges shots with the police while imagining himself being watched by an excited, applauding audience, just like the one he had watched Django with. Out of bullets, he comes out and challenges the police to draw. The police shoot him many times, and he drops. The film ends abruptly, cutting to a shot of a woman's torso gyrating to the sound of Ivan's song over the credits. The film stars reggae singer Jimmy Cliff, who plays Ivanhoe Martin, a character based upon a real-life Jamaican criminal of that name, better known as Rhyging, who achieved fame in the 1940s. Prior to filming, the project had a working title of Rhygin. 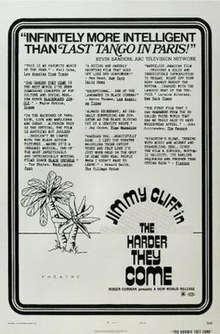 This then changed to Hard Road to Travel before finally being changed to The Harder They Come, prompting Cliff to write the song of the same name. The story very loosely follows the real Martin/Rhyging's life updated to the 1970s, though the historical Rhyging was not a musician or drug dealer. The film was a sensation in Jamaica due to its naturalistic portrayal of black Jamaicans in real locations and its use of Jamaican Patois, the local creole. According to Henzell, "Black people seeing themselves on the screen for the first time created an unbelievable audience reaction". The soundtrack to the film is considered a breakthrough for reggae in the United States. The film received positive reviews from critics. On review aggregator website Rotten Tomatoes, the film has an 89% score based on 28 reviews, with an average rating of 7.2/10. Roger Ebert of the Chicago Sun-Times gave the film 2 1/2 stars out of 4, writing that the "movie’s ending is an exercise in plot; its beginning and its music deserve better than that". The staff of Variety magazine wrote that the film "has a sharp and racy rhythm, in keeping with the synchopated music of the isle, plus an underlying social theme in the guise of a familiar tale". In 1980, Jamaican-American author Michael Thelwell published a novel based on the film, using the same title. Thelwell inserted many Jamaican proverbs into the novel that were unused in the film. In 2006, Prassad Corporation digitally restored the film, frame by frame, to remove dirt, tears, scratches, and other artifacts and recapture its original look. Prasad cleaned 14,000 frames. In 2005, The Harder They Come was adapted into a stage musical by the Theatre Royal Stratford East and UK Arts International in the UK, with a script overseen by Henzell. The show opened on 25 March 2006, boasting the original soundtrack as well as a couple of additions, including "The Ganja Song", written by Geraldine Connor, featuring Rolan Bell as Ivan. The production later moved to the Playhouse Theatre, and was performed in Toronto and Miami. A remake has been planned, with a screenplay written by Chris Salewicz. The remake is a joint venture between Henzell's daughter Justine, Xingu Films, and Conquering Lion Pictures. Filming is due to begin in 2013. In March 2015, it was announced that Cliff would reprise his role as Ivanhoe Martin. The Chase & Status track "Hitz" from the 2011 album No More Idols samples a line from the film, as well as the track "Sunday Dub" on the Tino Corp. release "Tino's Breaks Volume 5 (Dub)". The film is referenced in a line of The Clash's song "The Guns of Brixton" from the London Calling album (1979). Jimmy Cliff recorded a cover version of this song in 2011 and in his 2012 comeback album, Rebirth. ^ "THE HARDER THEY COME (X)". British Board of Film Classification. 4 April 1977. Retrieved 18 March 2016. ^ Katz, David (4 December 2006). "Obituary: Perry Henzell". The Guardian. London. Retrieved 12 April 2011. ^ a b McLellan, Dennis (2 December 2006). "Perry Henzell and Trevor D. Rhone; their movie `The Harder They Come' brought reggae to the world". The Los Angeles Times. Retrieved 13 April 2011. ^ a b Mennel, Barbara, Cities and Cinema, Routledge, 2008, p.170. ^ Salewicz, Chris (2 December 2006). "Obituaries: Perry Henzell, Director of the reggae classic 'The Harder They Come', Jamaica's first home-grown feature film". The Independent. London. Retrieved 13 April 2011. ^ Bordowitz, Hank, Every Little Thing Gonna Be Alright: The Bob Marley Reader, Da Capo, 2009, p. 58. ^ "The Harder They Come (1973)". Rotten Tomatoes. Flixster. Retrieved 18 March 2016. ^ Ebert, Roger (9 February 1973). "The Harder They Comes (1973) – Roger Ebert". Retrieved 3 February 2017. ^ "Review: 'The Harder They Come'". Variety. 6 September 1972. Retrieved 3 February 2017. ^ Coteus, Stephen. 2011. "'Trouble never sets like rain': Proverb (in)direction in Michael Thelwell's The Harder They Come". Proverbium 28:1-30. ^ thehardertheycome.com Archived 11 September 2014 at the Wayback Machine, The Restoration. ^ a b c Johnson, Richard (2012), "Keeper of the flame: Justine Henzell protecting her father’s legacy", Jamaica Observer, 11 November 2012. Retrieved 11 November 2012. ^ Jury, Louise (17 June 2010). "Reggae show The Harder They Come goes global". Evening Standard. Retrieved 12 April 2011. ^ "The Harder They Come", Playhouse Theatre. ^ Pulver, Andrew (11 April 2011). "The Harder They Come set for modern reggae remake". The Guardian. London. Retrieved 12 April 2011. ^ Henry, Davina (2015) "Jimmy Cliff To Reprise Role In 'Harder They Come Pt 2'", Jamaica Gleaner, 8 March 2015. Retrieved 8 March 2015.